During the Elizabethan era many of the people were still unable to read and write. The Globe Theatre Flags were a simple device which were used to advertise which play was to be performed that day. There was limited planning involved in respect of advertising. The owners and actors had to ensure a fast turnaround of plays. A play would be performed as soon as it had been written - Elizabethan actors had to learn their scripts quickly or rely on 'cue scripts' where the actors were prompted with their lines. 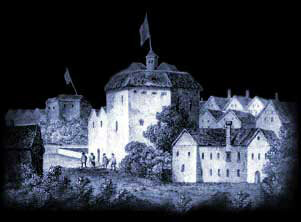 The Globe Theatre actors were known to have performed twenty different plays within the span of a month. The plays were usually different every day, in fact the most consecutive performances of a Globe Theatre play was only nine! "Each play-house advanceth his flagge in the aire, whither quickly at the waving thereof are summoned whole troops of men, women, and children"
Competition was fierce between the London Theatres - representatives were sent from rival theatres to note down the content of plays performed at the Globe Theatre - there were no copyright laws to protect the material. Elizabethan Plays were subject to censorship. Theatres were often closed at short notice due to outbreaks of the plague. For all of these reasons it was difficult to publicise plays in advance. So a simple communication method was used - Globe Theatre flags were used to publicise the play performances. Towering above the Globe was a small tower with a flag pole. Flags were used as a form of Elizabethan Advertising! Flags were erected on the day of the performance which sometimes displayed a picture advertising the next play to be performed. To announce the opening of the new theatre, the Chamberlain’s Men flew a flag featuring the figure of Hercules carrying a Globe on his shoulders. An even simpler, and cheaper method was used to advertise the plays - different colors were used which indicated that a performance was to be staged that day and whether the play was based on comedy, tragedy or history. White Globe Theatre flags were used to advertise that the play performed that day would be a comedy. Using white flag indicated that the play would be a light subject. Black Globe Theatre flags were used to advertise that the play performed that day would be a tragedy. Using a black flag indicated that the play would be a dark subject, associated with death. Red Globe Theatre flags were used to advertise that the play performed that day would be a history. Using a red flag indicated that the play would be a subject, associated with blood, as most plays based on history were! Interesting Facts and information about the Globe Theatre Flags. Additional details, facts and information about the Globe Theatre can be accessed via the Globe Theatre Sitemap.